In just eight short days, the highly-anticipated X-Files event series will debut on Sunday, January 24, directly following the NFC Championship Game. 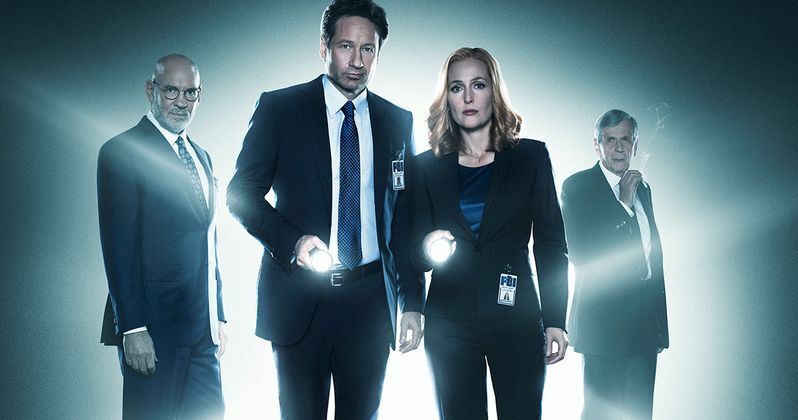 The series brings back the beloved characters Fox Mulder (David Duchovny) and Dana Scully (Gillian Anderson) back together, 13 years after the original series came to a close. Series creator Chris Carter recently appeared at the TCA winter tour, where he teased that the sixth and final episode ends with a "big cliffhanger," hinting that there may be more episodes. David Duchovny teased in May that he would be open to coming back for more episodes, provided that Fox didn't order a full 20-episode season. Fox hasn't given the green light for another season yet, but if fans respond to this new series, it's certainly possible. Chris Carter also teased that he is also considering making a third The X-Files movie following 1998's The X-Files and 2008's The X-Files: I Want to Believe. "If there is a third movie it's got to be a gigantic movie. It would have to be a big-budget movie; that's what X-Files fans want. We tried to do a very small movie about faith the second time out. And it was released in the middle of summer tentpole movies. It was a misstep in that way. I think [a third movie] has to be more like the first movie." This event series marks the momentous return of the Emmy- and Golden Globe Award-winning pop culture phenomenon, which remains one of the longest-running sci-fi series in network television history. The X-Files debuts with a special two-night event beginning Sunday, Jan. 24, 2016 (10:00-11:00 PM ET/7:00-8:00 PM PT), following the NFC Championship Game, and continuing with its time period premiere on Monday, Jan. 25 (8:00-9:00 PM ET/PT). The series will only run six episodes, but star David Duchovny has said in the past that he would be open to returning for another short season like this one in the future. The premiere episode follows Mulder and Scully as they take on a case of a possible alien abductee. The all-new episodes will feature appearances by guest stars Annabeth Gish as Monica Reyes, William B. Davis as "Cigarette Smoking Man" and the computer hackers known as The Lone Gunmen, Ringo Langly (Dean Haglund), Frohike (Tom Braidwood) and Byers (Bruce Harwood). The all-new episodes will feature appearances by guest stars, including Joel McHale (Community), Robbie Amell (The Flash), Lauren Ambrose (Dig, Six Feet Under), Annabeth Gish (The Bridge), Annet Mahendru (The Americans), Rhys Darby (Flight of the Conchords), Kumail Nanjiani (Silicon Valley). Three of the episodes are written and directed by Chris Carter, with the remaining new episodes written and directed by original series veterans Glen Morgan, Darin Morgan and James Wong. Do you think this show will be bigger than ever when it comes back in just a few short weeks? Stay tuned for more from The X-Files, and take a look at a tweet from The Wrap reporter Linda Ge which confirms the cliffhanger news. Uh oh we better hope Fox brings back more #TheXFiles - Chris Carter just told me this season ends on a huge cliffhanger.